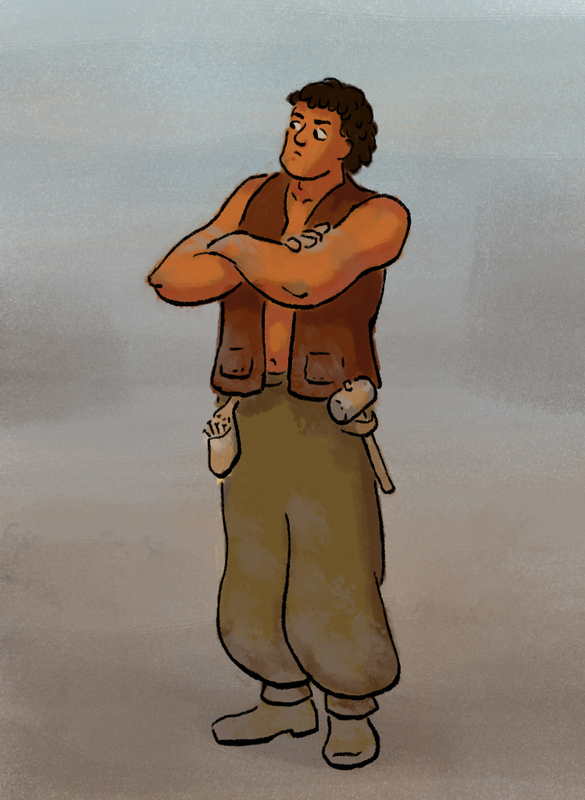 Here’s a concept drawing of the Blacksmith to distract you while I talk about technical mumbo jumbo. I know I’ve been quiet here, but I haven’t been idle. I’ve just been working on getting my invisible gremlins in a row. Since the launch, I’ve been looking into ways to optimize and reduce those atrocious loading times. I made inquiries at the Adobe Edge Animate forums, and the users there have been immensely helpful. Now I have two plans of attack. Firstly, each page can be drastically reduced in file size. If I use animated gifs instead of png sequences, I can reduce the page file size by about half. Each panel is small in dimensions and duration, so gifs are not the crappiest solution. Sprite sheets would be more useful if I were reusing animation frequently, but I’m not. Video (like h264) would be more useful if the videos were longer or higher res, but they’re not. I’m left with gifs. Lots of gifs. I’m going to build my own system for navigation. That will take some time and lots of learning on my part. But that’s nothing new—this whole comic has been a learning endeavor since the start. Thanks for explaining. I was clueless about “optimization” but I get it now. And I’m looking forward to a romance for Nwain? Keep up the good work.